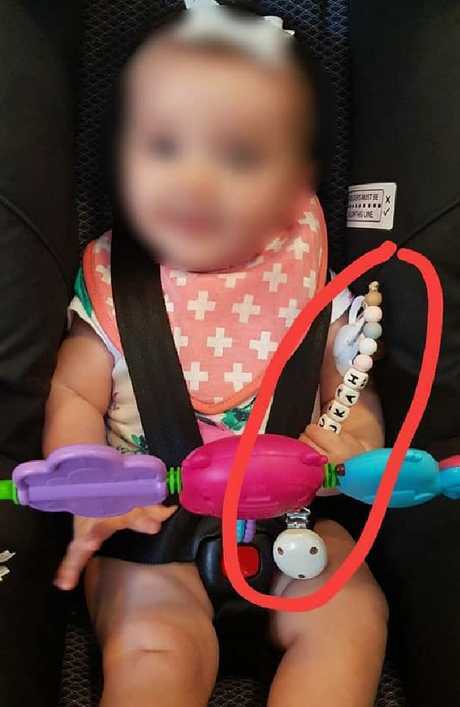 AN Australian mother has warned other parents of the dangers of teething garlands, after her daughter almost died when she choked on a bead. 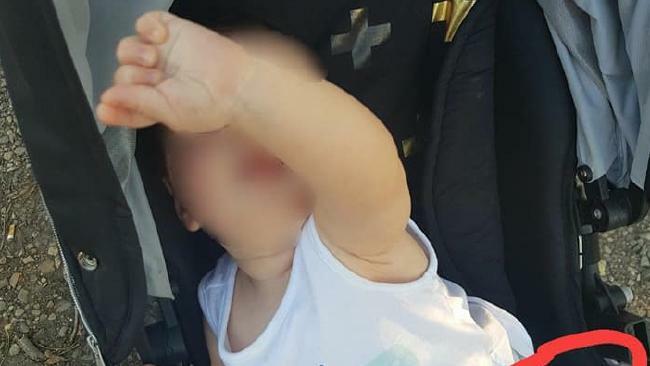 Kahla Hilton from Wagga Wagga took to Facebook and explained how a lunch date with a friend almost turned in to tragedy, as her daughter, Lukah, turned blue in front of her. "I wasn't going to post about this, but as a Mother, Aunty and friend of many with kids, I felt I had an obligation," her post read. "I had an experience yesterday that I'm calling the scariest of my life. It's a long story, a wild ride, but if you can hold on until the end I promise it has a good ending. "I was out to lunch with a girlfriend, we'd just ordered, and were sitting, talking as we normally would. I had Lukah in her pram next to me, and she was munching on a Rusk quite happily. Or so I thought." Ms Hilton said she started to scream when she noticed her daughter was turning blue. "I turned to look at her and noticed she had something in her mouth," she wrote. "At first [I] thought it was the end of her dummy chain, which she often chews on ... until I remembered she didn't have her dummy chain on. "About a split second later I realised that it was a bead from her teething garland, which has been hanging across her pram for months for her to chew on. "I quickly put my finger in the side of her mouth and got the bead out, and then I saw that she had another bead in there, half way down her throat. I started to panic, she was choking, and I froze. "As she went from pink, to red, to blue, I screamed at the top of my lungs for someone to help." The frantic mum said strangers "rushed from every direction of the cafe" desperate to help little Lukah. "The cafe owner called emergency services as I continued to scream like an absolute crazy person," she said. "My baby was going to die, that's all I could think about. "My loud screaming got the attention of people throughout the mall, including one man, who ran across the carpark, jumped through the open window, scooped Lukah up and had her in a downward position and giving her blows to the back within what seemed like half a second. "This man, was ex military, and he saved my baby's life. I owe him everything." 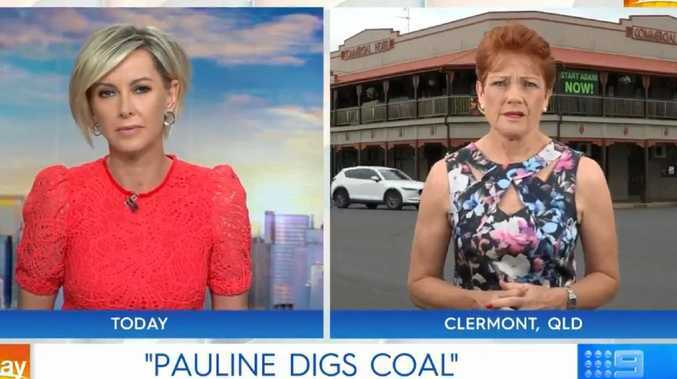 Ms Hilton said that while her daughter was given the all clear when she was taken to the hospital for a check-up, she wanted other mothers to be aware of the dangers of choking hazards. "I can't stop thinking that if that man wasn't there the outcome would've been a lot worse. He really is a superhero," she wrote. "I don't put blame on anyone for this happening. Not at all. But I do want to slap myself silly for putting so much trust in a piece of string. Never again. "Everything made with teething beads has been thrown out. And I highly recommend all parents consider doing the same. "In this instance, we were lucky. Lukah definitely had a guardian angel watching over her yesterday." 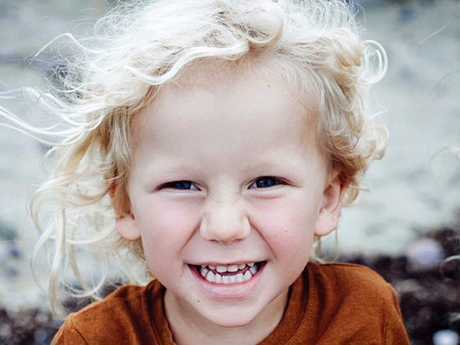 Tasmanian toddler Alby Fox Davis, aged 3, tragically died when he choked on a bouncy ball after it became lodged in his throat. Three-year-old Alby Fox Davis chocked on a bouncy ball earlier this year and died in his pregnant mother's arms. Alby was playing with the rubber ball, which was in a box of party favours for Alby's birthday celebration, and it got stuck in his windpipe, preventing his ability to breathe. His mum Anna Davis, tried desperately to save her son, but within seconds he died. Ms Davis posted to her Instagram page, The Small Folk, a side-by-side image of the ball compared to a 50 cent coin. "I was three feet away from Alby when the incident occurred and was by his side within seconds," she wrote on the post. "The ball was larger than the 50c piece/film canister size-recommendation for toys given to young children, and the ball packaging states 'not for children under three years'. "Being only a few days away from turning 4, Alby was almost one year older than this advice."